Oli, £55; Debenhams, £65; Topshop, £150; New Look, £28; Oasis, £75; La Redoute, £12.50; Monsoon, £135; Principles, £55; John Lewis, £90. Kav-z: The one from La Redoute is only £12.50, and the one from New Look, which I'm just going to have to buy, is £28. I'm sure if you shop around you'll find something. I reckon the only reason the Topshop dress costs £150, is cos it's from the Kate Moss collection! 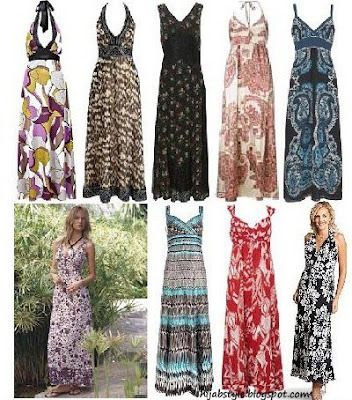 oh i saw something on "this morning" about maxi dresses and they showed one from monsoon i was going to have a look at , but i like the one from la redoute just as much. thanks for this! omg i am loving these dresses!! of course i love the monsoon one lol!!.. a little out of my price range !! What was it like ordering from ASOS? Was the delivery quick, and was the quality good? Also where is Utam? I like the first one. Purple and yellow? That would let me carry my yellow patent leather rocker clutch and not be too tough. Add a black pashmina and a tailored empire waist open abaya (I suggest every girl gets one of these made---they are so USEFUL---- the look is a front open abaya that slips on over top, but it has a slit from the ribcage down so you can wear long dresses and skirts with it. Better coverage than a cardi, but you don't give up your skirt. I think the style originated in Salalah, Oman, where the women are famous for their layered Arabic-flamenco style skirts (which is actually where flamenco and the words Al Hamra come from in Spanish culture---the Arabs were there). Oh I love the girls from Salalah. They taught me about how there is to be no race and tribe in Islam, and how beauty and modesty are both important to Allah SWT. Everyone should visit Salalah once, during Monsoon season, to experience it. After Mecca and Medina, of course, LOL. Insha'Allah. Sorry for taking all your comment room Hayah. If you do go to Oman though, I suggest bying walking shoes in the form of durable flip flops because women there don't buy walking shoes---everything has a heel on it and it is too hot for flats and runners. I only brought two pairs, and I wore both out navigating Oman's rocky terrain.